Marcus & Millichap is pleased to announce the sale of Yorkshire Court – 30 units located in Drexel Hill, PA.
DREXEL HILL, Pa., January 29, 2018 – Marcus & Millichap (NYSE: MMI), a leading commercial real estate investment services firm with offices throughout the United States and Canada, announced the sale of Yorkshire Court, a 30-unit apartment building located in Drexel Hill. The asset sold for $1,695,000. 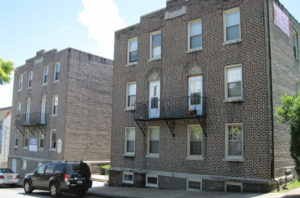 Clarke Talone, First Vice President Investments, Daniel Bernard, Associate, Ridge MacLaren, Senior Vice President Investments, and Andrew Townsend, First Vice President Investments of Marcus & Millichap’s Philadelphia office, had the exclusive listing to market the property on behalf of the seller. Matthew Rosenberg, Director in MMCC’s Philadelphia office, arranged the acquisition financing. The non-recourse loan was structured with a fixed 3.65-percent interest rate over a seven-year term amortized over 30 years. Yorkshire Court is located at 740 Burmont Road in Drexel Hill, PA. The 30-unit building consists of six studio units and 24 one-bedroom/one-bath units. “Yorkshire Court has received significant capital improvements in the last few years, and new ownership is in an excellent position to increase rents with further renovation of the large one-bedroom units,” said Talone.